Are you better off than you were four years ago? It’s a question asked at Obama campaign events, and I’ve been thinking about different ways one can answer the question. We can measure economic success a number of ways – housing costs, gas prices, energy bills, retirement account balances and net worth are all measurable, as is the most thought of indicator, income. Another – more unique – indicator of economic success during the last four years would be federal tax revenue collected. If you’ve been listening to Obama and the main stream media, we’re in the midst of the worst economy since the Great Depression where corporations get undeserved tax breaks, and the middle class have been screwed. They say the Bush tax cuts have failed, but what’s really failed is fiscal responsibility. Revenue is way up, spending is out of control. Yes, I do understand that many families are having a tough time, but to compare today’s economy to the Great Depression is just wrong. Ask those who lived through it. O’Biden and company are lying. Democrats have been pulling this stunt for years. The rally calls sound good, and voters seem to be smitten with not necessarily class warfare, but corporation warfare. Note the outright hatred towards companies like ExxonMobil [NYSE:XOM] with a net profit margin of 9.21 percent during the last year, and the pure love for companies like Apple [NASDAQ:AAPL] with a net profit margin of 14.88 percent. 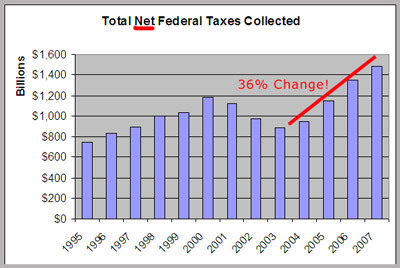 So, we know what’s happened to the total net collected, how about the amount collected from corporations? Well, it has doubled. In 2004, IRS data shows that the federal government collected about $185 billion from corporations and in 2007 the total grew 50 percent to more than $368 billion dollars. Individual tax payers also paid more taxes during the last four years. Individual federal income taxes collected increased 32 percent from about $763 billion to more than $1.11 trillion. But what about the tax burden of individuals as compared to corporations? I’ve created a detailed spreadsheet with federal tax revenue information for 1995 through 2007, the most recent data available. This spreadsheet has two tabs, and in the second tab titled percentages, you’ll be able to see how the tax burden changes between the individual and the corporations. 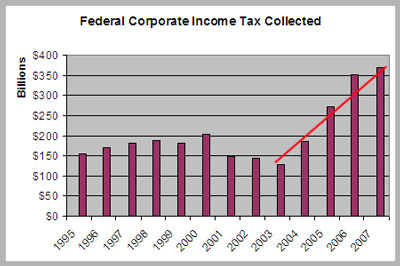 Between 1995 and 2001, corporations were paying less taxes – as a percentage – compared to individual filers. In 1995, corporations were paying about 21 percent of federal revenue collected, and by 2001 that percentage was down to 13.3 percent. 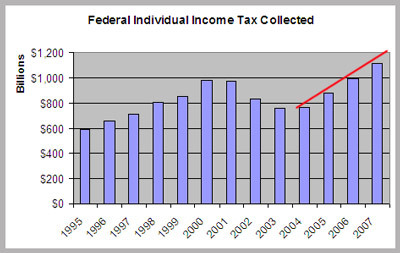 In 2001, individuals were paying 86.7 percent of the taxes collected. The first row is the corporation contributions and the second row is individual contributions. With the Bush tax cuts came a significant change. Within four years the trend had completely reversed back to 1995 levels. By 2007, corporations were contributing one quarter of the federal take. Two things happened after the Bush tax cuts of 2001 and 2003. First, the total percentage of tax burden immediately shifted towards corporations after 2001 and second, the federal government started collecting more money after 2003. If the federal government lowered taxes for everyone who paid taxes and still collected more money, it must be that we are doing better – when it comes to personal income – as compared to four – and even eight – years ago. Finally, why are the rich being asked to be patriotic and pay more income taxes? Why are the successful always punished, while the federal government is never asked to do with less. Note: You should research the data yourself. It was double sourced at a non-government Web site and IRS.gov. This Microsoft Excel spreadsheet – with two tabs – was created by the author to “clean up” the data provided at the IRS statistics Web site to make it more readable. 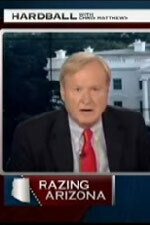 Matthews to Inglis: Maybe you guys hate Obama cause he's black? UPDATE: "I forgot he was black". I can say I'm worse off, but that's because I've had a bad year, having missed work for most of the Spring due to illness and recovery, followed by medical expenses. Otherwise I'd at least be the same if not better than before. Yup, the worst economy since the Depression, if you completely ignore the Carter years. Obama was presented with proof positive that lowering the capital gains tax results in a significant increase in gov't revenues, but he publicly chose to ignore that it the name of "fairness." How do you argue with that kind of economic expertise? On that page, you'll see links for each year going back to 1995. I took the data in those sheets and "trimmed" it a bit to create my sheets. Some of the tables from year to year are slightly different, but scroll to the right and you'll see a section identified as Net Collections. I've combined that information into one table that you see linked to in this story. Any other questions, contact me via http://conservative247.org/contact. Senator Government Do leading supporters understand Obama’s tax plan?